and Automation of the USSR Academy of Sciences. In 1992 when historic name of St. Petersburg was returned to the city the Institute in turn was renamed in St. Petersburg Institute for Informatics and Automation of RAS (SPIIRAS). According to the Decree of the Russian Federation Government dated 12/30/2013 No. 2591-p the Institute was handed over to The Federal Agency for Scientific Organizations (FASO Russia). The Russian Academy of Sciences and its Department of Nano-Technologies and Information Technologies (DNTIT RAS) provide for the scientific and methodological guidance in regard to the Institute research activities. The Institute does basic research and application developments in informatics, automation intelligent systems and information technologies. The Institute director is Professor of RAS Andrey L. Ronzhin. 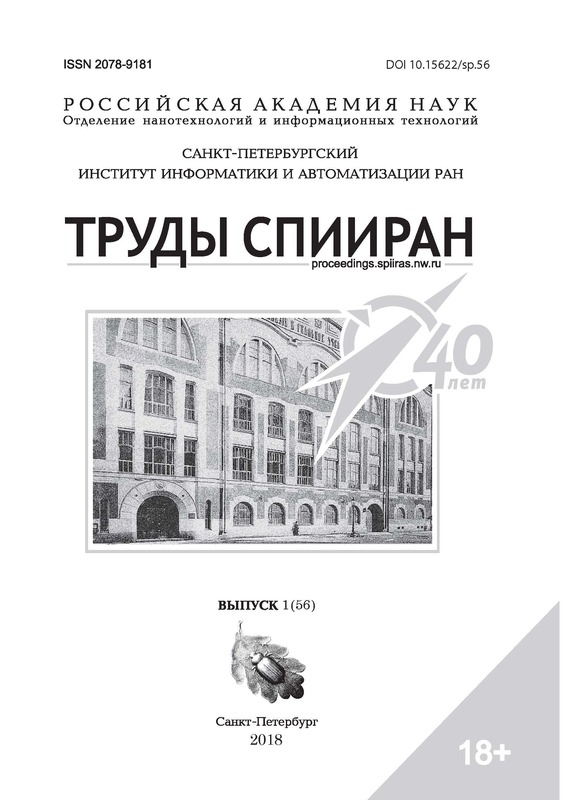 The journal of the St. Petersburg Institute of Informatics and Automation of the Russian Academy of Sciences "SPIIRAS Proceedings"
was included in the List of 100 scientific journals selected for the implementation of development programs in 2018. The journal has been published since 2002, it is published six times a year. All published articles have a digital identifier DOI. Free online access to the full content of the journal is provided. Fee for the paper publication is not charged. Since 2016, the magazine has entered the international database Scopus (Computer Science, Mathematics), CiteScoreTracker 2017 = 0.56; SJR 2017: 0,16. 5) mathematical modeling and applied mathematics.